Creative Movement/Ballet classes are designed for young children for the purpose of enabling them to master the basic motor skills such as skipping, jumping, leaping, and galloping. It is through creative movement in basic technique that simple dances are created to introduce students to the basic concepts of dance: body/action, space, body awareness, rhythm, coordination, balance, and social skills. Ballet/Tap Combo is a beginning level class dedicated to establishing basic knowledge and vocabulary in the areas of ballet and tap. Dancers will learn the five positions of the arms and feet as well as basic movement skills. Dancers will also learn how to be in a teacher led environment and practice simple classroom skills. Ballet training introduces students to the concepts of strength, flexibility, core stability and turn out. 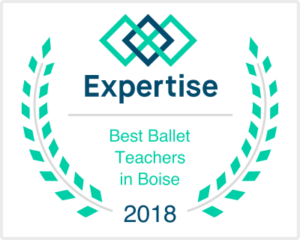 Our ballet classes offer a progressive study of classical ballet technique that teaches students how to be graceful and fluid in their movements. Students placement is determined by the number of years of past dance training and ability. Attire: Black Leotard; Pink tights; Ballet shoes; No overdress. Acro/Tumbling is for anyone interested in learning the basic fundamentals of acrobatics for dancers. Dancers will work on a progression of skills including, walk-overs, hand stands, hand springs, ariels, stalls and lifts. Strength and Flexibility is a class designed for dancers to work on their strength as well as their flexibility. The goal is for dancers to learn how to use their muscles in a way that will help prevent injuries as well as excel in their technique classes. Contemporary is a style of dance that combines and mimics several other styles of dance. Using the elements and background of classical ballet, modern and jazz, dancers will learn how to connect their minds and bodies into a beautiful and unique form of dance. Hip-Hop is a dynamic class that provides students with the latest trends in the constant changing style. Dancers should expect to receive fast-paced progressions and choreography. Hip Hop is designed to improve dancers rhythm and coordination and promotes a strong understanding of beats and musicality. A students placement is determined by the number of years of past dance training and ability. Tap is for anyone interested in learning the basic fundamentals of tap. Tap dancers will use their feet to create rhythmic patterns and timely beats. Tap is a great way for students to experience music and dance all in one art form! Pre-Ballet/Jazz is a class devoted to establishing the basic vocabulary and fundamental elements of jazz and classical ballet technique. This class is geared towards teen students who are trying out dance for the first time and need a strong foundation. Students learn the five positions of arm and feet, while learning the basic alignment of the body. This class provides the foundation for all further areas of dance training such as ballet, contemporary, hip hop and pointe. Jazz is a fast-paced, fun movement class targeting turns, leaps, and flexibility. This class incorporates body isolations as well as stretching and strengthening. Accompanied with fun, upbeat music this class appeals to many! A student's placement is determined by the number of years of past dance training and ability. Previous ballet experience is not required, but strongly recommended in conjunction with this class. Mommy & Me is a class designed for dancers walking to three years of age. Designed to be taken with an adult partner, this class explores the beginning levels of movement and music. This class is a fun and engaging way for the littlest of dancers to work on gross motor skills, basic dance terminology and social skills. © 2010 Boise Dance Alliance. All Rights Reserved.